Besides text formatting, you can also highlight particular cells by changing their background type. 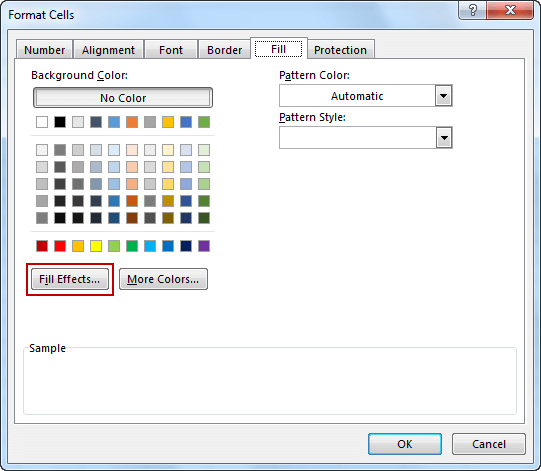 In Excel, you can fill cells with color, gradient, and pattern. Look at the following example. It shows our expenses for the next three days. It is a “clean”, unformatted example, which is not very legible. Let’s format some of the cells to create a nicer look. The Fill icon is located in HOME >> Font >> Fill Color. There is an additional icon in the lower right corner. Click it and you will get access to additional options. Select cells from B3 to B5. From the drop-down menu select the color Green, Accent 6. Then select cells from C2 to E2 and cell B7. Fill them with Blue, Accent 1, Darker 50%. For the cells with the dark blue background choose a white font color to make the text more readable. 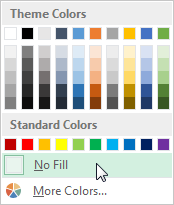 The Font Color icon is located next to the Fill Color icon. As I wrote at the beginning of this lesson, instead of using a solid color to fill the cell background, you can also use a gradient. To do it, first select cells from C7 to E7. Right-click them, and then select Format Cells… or use the Ctrl + Shift + F keyboard shortcut. When a window opens, select the Fill Effects… button. 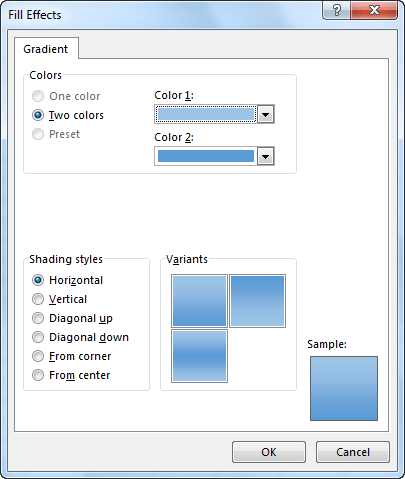 In the new window, you can set two colors. I suggest that you choose colors that are similar because the transition between them will be more subtle and it will create a more professional look. Select cells from C3 to E5. Open the Format Cells window and then click the Fill tab. 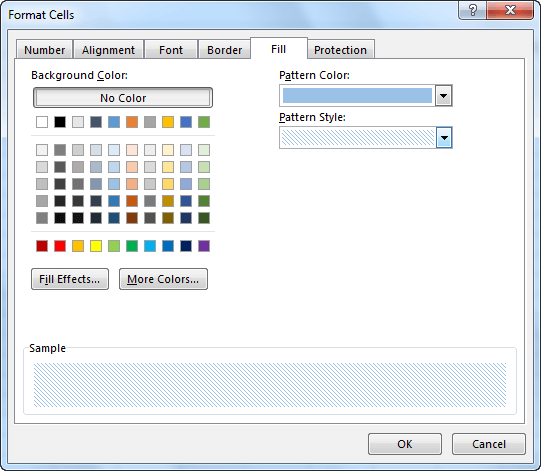 On the right side, you will find two drop-down menus: Pattern Color and Pattern Style. I suggest that you choose a light color, otherwise the background pattern will be distracting. After you confirm changes, the pattern will be applied to the cell. Now, the example looks much better than at the beginning and is also more readable. If you want to remove the fill from the cells, choosing a white background is not the solution here, because it will also remove the grid separating the cells from each other. Besides, it won’t remove the pattern fill. What you should do is use the No Fill option. You can find it in HOME >> Font >> Fill Color >> No Fill.